Premium interactive tests for everyone! Even if your school is not using any of the bellow features, you can still use this application! It contains many interactive tests from Math - where you have to think a little, English - where you need to understand the spoken word, some Geography, Biology and even Music. Try it out! Send messages to teachers, classes or parents. Start group discussions with the whole class or with all its parents. 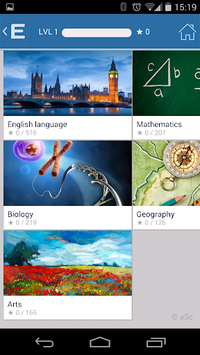 Teachers can input grades on mobile or in web interface, parents and students will see them in this mobile application. 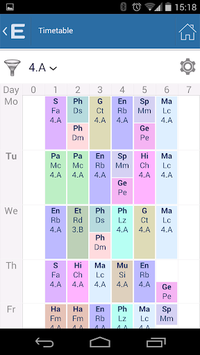 Input curriculum for each lesson directly from your mobile. Lesson plans can be used to simply pick the next topic. Input absent students. Class teachers can also input absence notes or simply allow parents to send electronic absence notes directly from their mobile phones. Input the homework. Students and parents can view and mark them as ready. They will love you! Check the daily substitution changes on your mobile. Includes push notifications. (School needs to use aSc Substitutions). Create interactive tests for your students. The results are automatically collected and the assignments are evaluated. View the weekly menu. It is also possible to order or cancel the meal for each day. 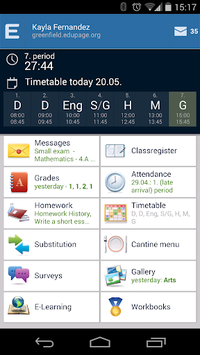 Anything that teachers inputs automatically generates notification on your mobile. No need to check webpage now and then. If your school is not using EduPage, you can still use this application to input grades and homework. If you add emails of your parents they will be able to use this same application to check what you have inputted. It is also possible to invite your colleagues and share the data with them! Check www.edupage.org for more information how your school can benefit from using EduPage!